I told myself I'd make life easy for myself this week and just do a headshot and this just came to me. It was a total breeze to do -- about 2 hours from idea to pencils to digital paints (Photoshop). You can check out the pencils on my sketchblog, if you're interested. Great job, man! Love the concept. great idea, and great execution. 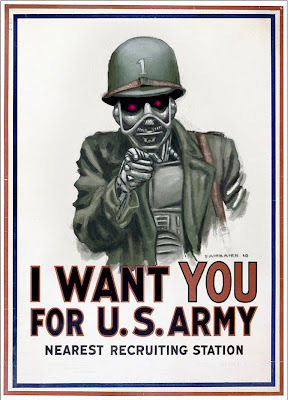 If the Army used robots to recruit, I might do it! Really nice idea man. I'm stumped as to what im gonna do. Damn! You beat me to it! I was gonna do a version of this! Not as well as you've done it but I was gonna try at least! Great idea, beautifully executed. Good work, sah! Thanks a lot, good people! There really wasn't much to it -- this one was all about the concept. Again man, you're blowing me away with the rendering. GREAT idea. Great job, Nathan! You captured that vintage feel with the rendering perfectly.